What is neck pain? Understanding the neck pain is not difficult. Usually, the doctors explain neck pain as a condition in which the patients feel pain in the muscles, bones or ligaments. It has been mentioned above that ligaments, bones and muscles are responsible for the support and movement of the head. Head has a weight that’s why any injury or problem with the muscles or bones in neck causes pain. What happens when pain occurs? As a matter of fact, the ligaments and muscles have a natural alignment. There is a need to maintain this posture or alignment in order to avoid pain. Usually, the pain starts when muscles, ligaments or bones show extra rigidity and this condition leads to pain. Let’s see the important causes of neck pain because this information is very essential. 1 How to diagnose neck pain? 2 What to do after diagnosis? 3 How to get rid of neck pain? How to diagnose neck pain? Identifying the neck pain can be simpler. There are several methods and tests being used for the diagnosis of neck pain. Normally, the doctors can diagnose this problem with the help of clear indications and symptoms. However the complex cases are handled with the help of modern technologies. Diagnosis of the neck pain can be done by using following methods. This is a simple method being used by the experts. The chiropractors or orthopedics will check your neck and shoulder by using the symptoms expressed by you. The experts may ask for the physical examination, medical history of patient and some imaging tests to confirm the neck pain. Normally, the doctors check range of motion, reflexes, nerve function and muscle strength. This is a test that can be used to check any fracture or inflammation in the neck. The neck bones can be damaged by any physical shock. MRI has been identified as an excellent test to check the problems with bones, nerves and muscles. CT Scan is another famous test based on modern technology. This test is commonly used to identify the problems with nerves and bones. This method is also useful to recognize the neck pain especially if caused by pressed nerves or muscles. What to do after diagnosis? You are required to ask the doctor about intensity of problem. In some cases the patients don’t feel pain or they become habitual with the pain so they don’t realize the severity of problem. It would be better to consider the severity of neck pain in order to take further decisions. Also check the icd 9 code for neck pain in order to have more information about severity of case. This method is very simple. However, it is best for short term neck pain. You can decide about the pain killers after searching the neck pain icd 9. This code helps the physicians to choose right dosage of pain killers to give some relief. If your mattress is old and pompous then you should buy a new one. It would be better to check the best mattresses for neck pain. Spring mattress, air filled mattress and double foam mattress are some good example for the neck pain patients. You also need a comfortable pillow for neck pain. In some cases the neck pain is caused by the damaged or old pillow. Changing the pillow can give quick relief. 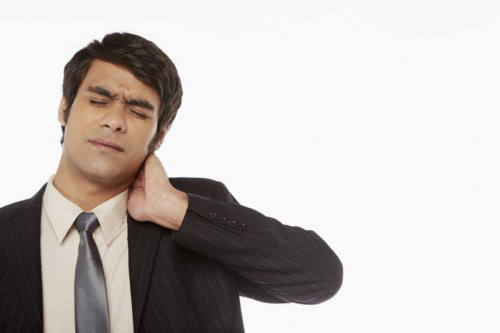 There are so many methods to get quick relief from the neck pain. In most of the cases, the patients come with minor neck pain. This problem is very easy to control. Remember, there is no need to visit a doctor if you have neck pain due to a sudden jerk or wrong sleeping position. You are suggested to keep some important steps in mind in order to seek neck pain relief. We have searched some helpful steps to relief the neck pain. This is an old but effective method. Ice can be applied on skin or place where pain is present. Remember, ice cubes are ideal for this purpose. Apply the ice on the portion that hurts. This practice should be done for a few days. Remember, it is necessary to apply the heating pads after icing. You can also take a hot shower to relax the muscles. For the treatment of short term neck pain, it is recommended to take pain killers. Some general products including the Acetaminophen and Ibuprofen are considered perfect for neck relief. It would be better if contact with your physician for more explanation about these pain killers. You need a break from the sports, athletic activities and gym workouts. Remember, if you will try to continue one of these activities with neck pain then there will be more problems. It is required to take a short break for physical rest. The neck muscles and bones will try to get the original position in this period. However, it is also recommended to resume these activities gradually after improvement. There are several exercises for neck pain. Exercise the neck on regular basis helps to remove the stiffness and pain. 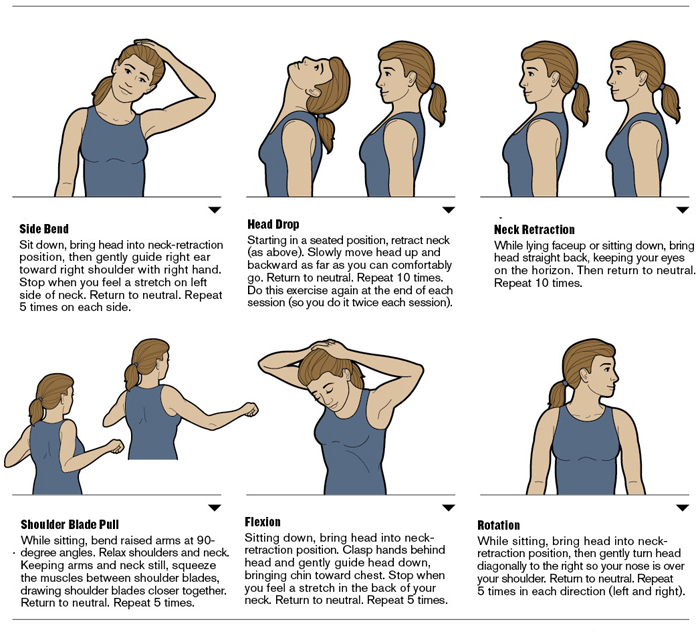 All you have to do stretch the head gradually up and down to get feel quick relief in neck pain. Bring the best pillow for neck pain. Your sleeping posture can develop pain in the neck that’s why it is required to change it. You can use neck pain pillow in order to maintain the sleeping postures. It will also help to keep the head in right position. It has been noticed that people usually cradle the cell phones between shoulder and neck while driving. This practice is very dangerous. It may lead to a car accident as well as sudden jerk to neck. Sleeping on one side for longer may damage the neck muscles and bones. It is recommended to change the position frequently while sleeping. On the other hand, the position of head and neck should be changed while working at office. Don’t keep it stiffed for longer. As a matter of fact, neck massage can be helpful for neck pain relief. This can treat the chronic neck pain very quickly. Those who have severe neck pain are suggested to visit the best physiotherapist for perfect neck massage. Remember, the neck collars and braces are selected by the doctors after checking the type or stage of neck pain. There are so many other factors involved in the selection of right collar or brace for the neck. Improper use of neck collar may cause neck and shoulder pain. Don’t purchase braces or collars if you feel neck pain. Visit the doctor and see what he recommends. If you are finding how to get rid of neck pain, then you should search the treatments. As a matter of fact there are several treatments for neck pain but choosing the most suitable according to your situation is a big challenge. Normally, this job is done by the chiropractors and orthopedics but you can get support from some online sources. Following treatments can help to obtain quick neck pain relief. This is a considerable treatment that can provide efficient results. In most of the cases this practice also supports the patients to treat the back and shoulder pain. This treatment is also useful for the neck and shoulder pain. While working with computers and laptops, you have to ensure that your eye level is correct. You have to make sure that your eyes and computer screen is on same level. Move your neck around in order to avoid stiffness. This treatment is useful for the people who use to listen to phone calls during work or driving. It has been mentioned above that cradling the phone is dangerous. It causes shoulder and neck pain. Neck stretches are very common and useful. Basically, it is an exercise recommended by the experts. You can use this exercise to treat the neck pain. It is good to regulate the blood in body. Drinking more water will keep your hydrated and it will support the normal functions in body such as metabolism. Your chiropractor or physician can tell you how to relieve neck pain by using simple exercises. Remember, neck pain is a delicate issue that’s why it is not feasible to use unreliable workouts. We have mentioned some practices in the yoga section. However, if you want to use some exercises then using the following for neck pain treatment will be helpful. Stretch exercise is very simple way that you can do by yourself. if you want to use some exercises then using the following for neck pain treatment will be helpful. Neck strengthening: This is a simple exercise in which you have to improve the posture. This will reduce pressure on neck. Aerobic conditioning: This exercise is useful to promote the blood circulation in body. It is also helpful to maintain the muscle and tissue strengthening. Neck stretches: Stretches are easy for everyone. You can apply any stretching method in order after seeing some neck pain symptoms. Yoga becomes an important treatment when people suffer from the severe neck pain. Yoga is commonly preferred for the pain and inflammation caused by any accident, poor posture, stress and long term physiological effects. Yoga has a prominent role to relief neck pain. You can cover the muscle tension, stress and shoulder pain while treating the neck pain. Yoga can be used for the treatment of neck pain by using following practices. These are two poses used for the yoga. These poses are also known as “cow pose” and “cat pose”, respectively. The cow pose is considered to bring flexibility in the body. This pose helps to stretch the neck and torso. In contrast, the cow pose focuses more towards the back and shoulder. It treats the neck pain while providing soothing effect. You will be guided for Balasana when finding best yoga exercises for neck pain. This yoga practice is usually preferred by the experts because it provides more flexibility to the neck and shoulder. This practice helps the patients to release tension and stress. Place your hips on the heels and put your head down while extending the arms forward. This position will become like a child lying down on floor. The Ardha Matsyendrasana is also known as Seated Twist Pose. This yoga practice has been recognized as a useful option for neck pain relief. According to the experts, the Ardha Matsyendrasana is also useful for the shoulder, knee and back pain treatment. Just sit down and grab your knee while moving backward. This exercise helps to release the tension and stress. This yoga exercise is very common. Normally, we move the head towards shoulders when there is pain in the neck. This is normal but it is according to the yoga principles. It is very easy and simple. This yoga exercise is for favorable for everyone. You can repeat it several times in morning and evening. It would be better to stretch your neck according to the intensity of pain. Never try to push extra because this will cause more pain in stiffed neck. In order to perform this exercise easily, it is required to look on extreme right and then left. However you have to bend the head little down towards the shoulders. This will give you sudden relief. This is another yoga exercise for neck pain relief. In this practice, the patients have to put a leg on wall and exert little force. Normally, it is considered a relaxing practice because it gives quick relief. In most of the cases this yoga practice is used to relax the nerves, to boost blood circulation and to maintain the spinal pressure in the body. You can control the severe neck pain by using this yoga practice. It is also called Corpse Pose. This yoga practice has been categorized as a relaxing pose. You have to spread a mat and use it for relax. Normally, this exercise is used for the warm up in the yoga classes. This yoga practice allows the body to adjust with challenges. Make a flat position and extend the legs. If you are uncomfortable in this position then you can keep the knees up. You can make any adjustment according to the physiological situation when using this practice. Avoid using computers for long. Take rest after seeing symptoms of neck pain.